HAYS – Troy faced a 3rd-and-36 from its 18-yard line late in the third quarter. Trojan coach Derek Jasper called for a play where three Trojans run vertical routes. Senior quarterback Reid Greaser was supposed to simply throw deep. Instead, the play produced a memorable 82-yard touchdown reception from senior wide receiver Brody Winder. Greaser’s pass went to guarded Trojan senior wide receiver Cuttar Huss, who deflected the ball to Winder. The score, with 2:21 remaining in the quarter, provided the final points and eventual game-winning touchdown. 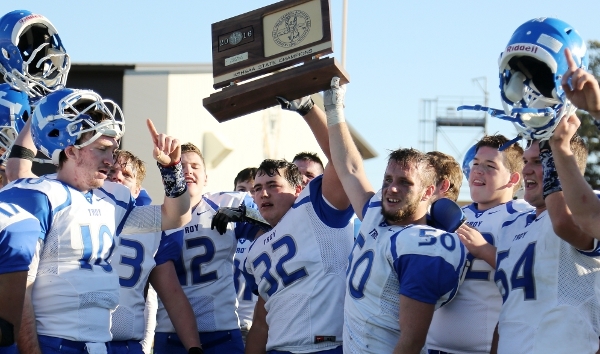 Troy held on to defeat Plainville, 28-24, in the Class 2-1A championship game Saturday afternoon at Fort Hays State University’s Lewis Field Stadium. “I saw the ball up in air, and I was like, ‘Cuttar is there, he is going to catch this,’ and I was hoping he would, but I was there to catch it,” Winder said. Late in the fourth quarter, Huss essentially sealed the victory when, double covered, he caught a 14-yard pass on 3rd-and-13 to the Plainville 44-yard line. Troy gained another first down and then kneeled the ball to run out the clock. The two plays capped a back-and-forth contest that featured six lead changes. Troy, ranked No. 1 all season, went 13-0 and won the first state football title in school history. The Trojans have a four-year run of quarterfinals, semifinals, runner-up and title, the best in school annals. Last season, Troy lost 30-29 to Phillipsburg in a game that was decided late in the fourth quarter. Huss started crying on the field after the Saturday’s contest. Plainville, 3-6 last season and in its first title since 1985, finished 11-2. The Cardinals ran 18 more plays than Troy. However, Plainville missed 25-yard field goal in the first quarter and had a drive end at the Troy 2-yard line in the fourth quarter. Plainville also had another drive stall at the 19-yard line to open the second half. Troy defensive coordinator Don Cash coached his final game and has announced his retirement. Plainville had just one offensive touchdown after its first drive. Senior nose guard Jarren Frump helped secure the middle after Plainville senior Riley Nyp opened with a 2-yard run. As well, senior linebacker Kortin Blevins and Huss delivered a game-high 11 tackles. After Nyp’s touchdown, Huss caught a short pass and went 71 yards to tie the contest. Following that, the Cardinals heavily focused on Huss. Winder caught a 61-yard scoring pass for a 14-7 lead. He finished with five catches for 207 yards and two scores. “They started paying so much attention to Cuttar Huss and left some other people to run free,” Jasper said. Plainville senior standout quarterback Hayden Friend delivered another memorable contest with 13 carries for 109 yards. He completed 16 of 29 passes for 175 yards and returned a kickoff 69 yards for a score that tied the game at 14 at the end of the first quarter. Plainville led 17-14 at halftime after a 27-yard field goal from sophomore Tanner Copeland. In the third, Troy took a 21-17 lead on a 30-yard pass from Greaser to senior Tyler Franken. “Tyler Franken, what a huge touchdown he had, but that’s because Cuttar Huss was drawing a bunch of attention, and Tyler was just wide open,” Jasper said. Greaser finished 14 of 21 for 374 yards and four scores against two interceptions and faced little pressure all game. Nyp scored from three yards out for a 24-21 lead with 3:56 left in the third quarter. A short time later, Troy had its version of the immaculate reception. On three verticals, Winder and Huss (six catches, 121 yards) are supposed to be more spread apart. “Thank God today they were running right next to each other kind of,” Jasper said. Greaser threw the ball down the left sideline. Huss jumped for the catch. “I saw Cuttar go up for it, and I thought no way he brings that down,” Jasper said. However, Winder was very close to Huss. The ball deflected straight to Winder who ran in for the touchdown. Greaser called the play “luck pretty much,” and Jasper agreed. Still, the play eventually held up for the final margin. Plainville reached the Trojan 2 and 34-yard lines on fourth quarter drives but couldn’t score either time.